Extreme Rules is the night where WWE basically adds a stipulation to the majority of their matches. Lately it's been the post WrestleMania show and it's never really been a GREAT show. In fairness to WWE though, it's hard to follow up your biggest PPV extravaganza. 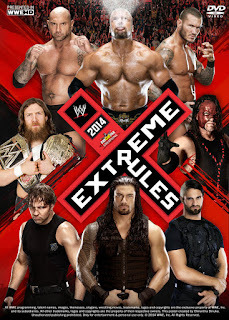 We will delve into all Extreme Rules PPVs since 2009-2015. The ranking will be from worst to best. -This is the absolute worst Extreme Rules PPV ever (so far), for a plethora of reasons. The majority of the card was based on WrestleMania stipulations. Triple H vs Lesnar was a rivalry that lasted way too long. This match was not very fluid. Their WrestleMania match was much better and told a much better story. Elsewhere on the card, we have Cena vs Ryback with Ryback sounding like Sid Vicious when he and Hogan were feuding at WrestleMania 8. This effectively destroyed all the momentum Ryback had gained. The only cool moment of this show was the Shield winning the gold and taking their place in the WWE elite. This PPV shouldn't have happened. -This card on paper looks solid, but the PPV really failed to deliver. John Cena vs Batista wasn't bad until the end where Cena looked like a child instead of a credible foe to Batista. Elsewhere, we had Triple H officially become a part time competitor after Sheamus attacked him before the match began. At least CM Punk vs Rey Mysterio was a great match, much better than the short time they had at the WrestleMania 26. -This version of Extreme Rules was so so. On one hand, Daniel Bryan and Kane seemed so cartoonish. Kane has been better, but this wasn't one of his better matches here. On the other hand, The Shield and Evolution had great chemistry and was genuinely one of the best faction vs faction fights I'd ever seen. I was worried that Evolution would look slower next to the young faster and stronger Shield, but they paced this match very well. Elsewhere on the card, Bray Wyatt vs Cena was a solid cage match, but the ending was very convoluted. Having Bray pin Cena instead of walking out of the cage would've had a much better effect. We also saw Paige defend the Divas title vs Tamina, who I think is very underrated. We got Barrett vs Big E for the IC title, which in my opinion was a waste, as Big E was a credible champ. Barrett didn't gain anything from this title reign (or any IC title reign he's had, but that's another story for another article), and while I expected WeeLC to be terrible, it was actually fun to watch, as strange as that sounds. -WrestleMania hangover was in effect for this version of Extreme Rules, but this was a solid card. The main event saw John Cena win the WWE title (what a shocker) in a deceptively good cage match. Orton vs Punk had yet another great match continuing their rivalry. Christian and Del Rio put together a fantastic ladder match which saw Christian share a cool moment with his recently retired Hall Of Fame friend Edge. This was well deserved and Del Rio didn't lose any credibility over this, as he would have a great 2011. Elsewhere, Cody Rhodes and Mysterio put on another solid work. -If you would've told me that Roman Reigns and Big Show would be in the best match on a card, I probably would laugh at you but that's what happens. Part of it was because this card was weak, but these guys worked hard and told a great story. Elsewhere, the main event was okay seeing Rollins get revenge on perhaps the greatest RKO I've ever seen. John Cena and Rusev had a strap match for the US title which wasn't bad, but it began Lana’s solo ascension, which to me was a distraction on the match. Ambrose vs Harper started off well, but it got too much when they left the arena and came back. This was also the PPV where the ascension of New Day began. This was odd at the time because New Day wasn't over yet and Cesaro and Kidd were. Hindsight is 20/20 vision though and that made perfect sense. Ladder Match for the World Heavyweight championship. -The two very best ladder match competitors never fail to amaze us and this was one of the best matches in both men’s careers. CM Punk had an engaging Strap match with Umaga. The PPV started off with a great Fatal 4 Way match for the US Title and we also got to see Chris Jericho and Rey Mysterio have one of the best IC matches seen in a while. WWE’s resident superhero John Cena fought Big Show in a submission match. Not bad but not that great either. Batista and Orton in a steel cage was pretty good as well. Orton was his normal slithery self. This was a pretty good card overall. All in all, Extreme Rules is usually one of the worst cards WWE has, but that's because WrestleMania hangover is very real. Since Payback has jumped this PPV in the pecking order, we shall see if this PPV has WrestleMania hangover.